Three weeks after the discovery of Mallory's body, a second search effort was to be mounted as well as a summit bid. Because Mallory's pose - face-down on the slope - didn't match Wang's apparent description of the "English dead" with a hole in one cheek, we assumed Wang must have found Irvine. Therefore it was now planned to search the region east (left) of the 1975 Chinese Camp VI. Yet after the party had reached Camp V, they were hit by a snow storm and had to remain tent-bound for three days. Then oxygen and provisions were running low, and the fresh snow cover rendered any search efforts in unknown terrain practically futile. Eventually it was decided to abandon any plans to look for Irvine. Instead, Andy Politz and cameraman Thom Pollard decided to revisit Mallory. Politz and Pollard reopened the grave and, using the White's metal detector they had brought along this time, scanned the body and its surroundings. This was to ensure that the camera wasn't hidden in one of Mallory's pockets or in the scree surrounding the site. They located the rivets on Mallory's leather motorcycle helmet, the buckles on his knickers and braces, and - an item the first search team had overlooked - Mallory's wristwatch, stowed away in one of the trousers pockets. But again no sign of the camera. 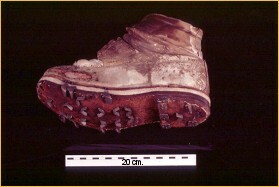 The two climbers recovered a few more artefacts, including Mallory's right boot and most of the climbing rope. Shortly before re-interring Mallory, Andy Politz lifted the frozen body high enough for Thom Pollard to take an oblique look at Mallory's face. It was the first time anyone did, because out of respect for the dead and the wish not to disturb him more than necessary the first search team had never turned the body around. "The face was in perfect condition. It was ever so slightly distorted - pancaked, in effect - by the years of bearing the weight of snow. His eyes were closed. I could still see whiskers on his chin." Continuing his investigation, he eventually found the most likely cause of Mallory's death. "Over his left eye, there was a hole. There was dried blood, and two pieces of skull sticking out. It was as though someone had taken a ball-peen hammer and smashed in his forehead." After restoring the grave to its original state, Politz once more read the committal service. 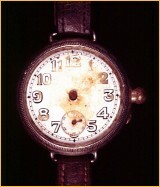 This completed the investigation of the Mallory site. As the crucial piece of evidence, the camera, had neither been found with the body nor in the near surroundings, there is no reason for others to revisit the site.